As a teenager in New York City, Joseph Zeisky began his internal martial arts training in Yang Style Tai Ji Quan with Grandmaster Don Kuk Ahn in 1984. Since then, Joseph has accumulated over 35 years experience in various martial arts styles, body movement disciplines, wholistic health and nutrition sciences, and explored some of the more mystical aspects and practices of the world's major religions and the spiritual practices of lesser known groups. Because Joseph primarily grew-up in New York City's Manhattan-West-Village-East-Village areas, he was fortunate to have been exposed to many of it's invaluable resources, information centers, schools and universities, finding amazing rare book stores, esoteric/religious organizations and dynamic martial arts schools all within a day's walk! Eventually, by his early 20s and 30s, his martial arts training began to focus primarily on deepening his study of the Chinese Internal Arts of Tai Ji, Ba Gua, Xing Yi and Yi Quan. He directly studied extensively with these other world reknowned teachers: Grandmaster Yu Cheng Hsiang, Master Bruce Frantzis, Master Luo Dexiu and Master Marcus Brinkman OMD. Parallel to his internal martial arts training, he also intensively studied and researched the energy healing science of Qigong and it's closely related more spiritual practice of Taoist Meditation. 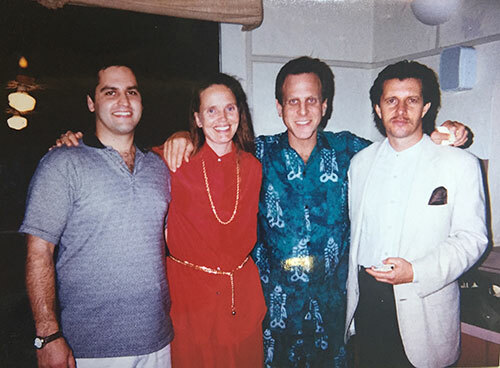 Hippocrates Health Institute, West Palm Beach, Florida, U.S.A. - Joseph pictured here with the directors of the Hippocrates Health Institute, Brian Clement Ph.D., L.N. and his wife Anna Maria Gahns-Clement Ph.D., L.N. (1996 or '97), after a week long intensive course in Living Foods philosophy, methods and recipes, as well as wholebody and colon detoxification methods and techniques. From the early age of 8 years old till his early 20s, Joseph apprenticed in a traditional European fashion under the strict but patient daily tutelage of his Hungarian father Andre L. Zeisky, who had gained an excellent reputation as a jeweler and gems setter and was highly respected amongst the finer jewelry establishments in New York City. This training/work experience with his father greatly contributed to his success in all other fields and gave him the foundation from which to further understand the real meaning of being inventive, patient, disciplined, persistent and hard working. 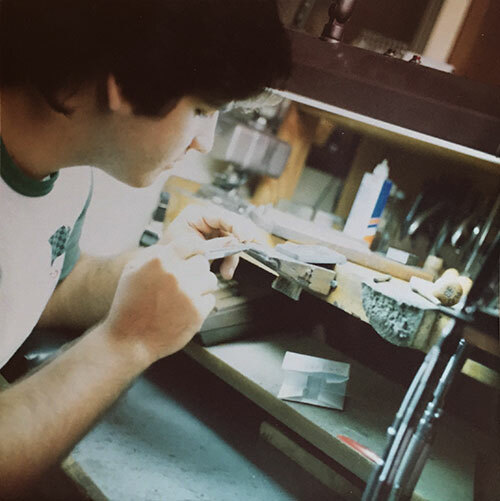 At the Family WorkShop, Midtown-Manhattan, New York, U.S.A. (late 1970's - early '80s)A teenage Joseph apprenticing in the fine art of jewelry making and fine gems stone-setting, under the patient tutalage of his beloved Hungarian father, Andre L. Zeisky. For over three decades, Joseph worked as a second generation fine gems setter, custom design jeweler and shop manager to the jewelry industry. And, even though teaching the Taoist Internal Arts are more of his passion and focus these days, he still very much enjoys being a goldsmith and jewelry designer, occasionally being commissioned to make beautiful one-of-a-kind handmade pieces of jewelry by private clients, family and friends. 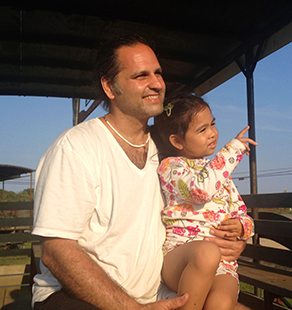 Additionally, after having attended a few classes at the Parsons School of Design in the 1990s, Joseph was further inspired to continue teaching himself computer graphics, video production and website construction, and now freelances his computer and video skills for clients interested in multi-media and video productions (sample productions: 1, 2, 3, 4) and website design (sample sites: 1, 2, 3). Copyright © 2002-2018 Zeigua Arts, Inc. / Joseph Zeisky. All Rights Reserved.